It’s often difficult to find skin care products that I can actually reap the benefits from. I have ultra sensitive skin, so most of the time a great deal of irritation is caused by skin care products. Whether it is facial moisturizer, toner, eye cream, or facial cleanser; I seem to not have much success. I recently started using the Obagi line. I have received the greatest results with the Obagi products. The Vitamin C Serum is one of my favorite products for everyday use. I use the 5%, that is formulated for the sensitive eye area, all over my face. I find greater results when I use the 5% as opposed to the higher concentrations. (My dermatologist recommended the lower concentration, due to my ultra skin sensitivity.) I apply the serum around the eye area and the rest of my face, every morning, followed by an application of sunblock. I have noticed less irritation from the sun since I started using the Vitamin C Serum. My skin has a constant glow, and very seldom feels dry. The most irritating part of Summer is the sweltering heat! I have a few solutions that will prevent you from appearing unkempt allowing you to maintain freshness!TIP #1 – Apply SPF EVERYDAY! Apply SPF to your face when you go out doors. (Even to the mailbox) If your skin becomes a bit dry, consider switching to a more hydrating cleanser. TIP #2 – Apply minimal makeup or NO makeup! Consider switching to a light weight formula of foundation, or a tinted moisturizer. If you feel you need more coverage, apply concealer only in specific areas. Consider replacing lipsticks for lip-treatments with color. (Bobbi Brown & Nars has great natural colors. )TIP #3 – HYDRATE! Keep a travel size fan or utilize the cool air feature on your blow dryer, to cool your hair and around your neck. This will prevent your hair from becoming frizzy and sticky. The less makeup you wear – the less you will have to maintain. 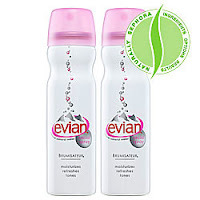 For those who wear heavier applications of makeup, considering purchasing a travel size 5oz Evian Mineral Water spray. This is will hydrate your skin while preventing the makeup from wearing off and caking.